#1 Ocho Ocho Ocho (6-1): California invader went undefeated in three starts as a 2-year-old but didn’t run a lick when eight of 10 behind Dortmund and Prospect Park in Santa Anita’s GII San Felipe last month and will look for a reversal of fortune today. Son of Street Sense impressed in a game GIII win in the Delta Jackpot in November, and you have to think he was simply a short horse last time, but geesh, couldn’t he have maybe run a bit better than that? Not sure what to make of this move by Cassidy, as staying home to run in today’s GI Santa Anita Derby would seem a lot more logical, which means this is Plan B, which doesn’t speak volumes of his chances, no matter how weak this cast is; underneath, if at all. #2 Gorgeous Bird (8-1): Blue-blooded Whitney homebred is by Unbridled’s Song out of Elusive Bird, which means he calls Belmont/Travers winner Birdstone and Kentucky Oaks winner Bird Town kin, though his meek fifth in Gulfstream Park’s GII Fountain of Youth when last seen in February means he’s not anywhere close to their talent level, at least yet. It’s nice to see Wilkes forge on, though, and, aside from the imposing favorite Carpe Diem, there’s no one in here to be scared of, but there’s also no doubt that he’s going to have to run a lifetime best to get into the number. Of course, we see these lightly raced 3-year-olds jump up all the time, and his optional claiming win at GP in January was a beauty, so if you’re looking for a price underneath, you could do worse than landing here; not impossible for a share. #3 Pepper Roani (12-1): Synthetic specialist has looked good in his last two at Turfway Park since blinkers were added, when he aired in an MSW and was a good, albeit distant, second in their Battaglia. Maker charge is by Broken Vow, so this trip will be right up his alley, but up to now his lone dirt run was a dreadful eighth earlier in his career going two turns at Churchill Downs, so there are questions to be answered to be sure. Obviously he’s a better horse now and blinkers seemed to have really turned him around as well, but until he shows he can run on dirt, it’s wise to take a wait and see approach; making him prove it. #4 Unrivaled (12-1): Intriguing Parx runner has won by a combined 20 lengths in his last two starts since being stretched out to two turns and he overpowered a field of N1X foes last month, which was his 3-year-old bow. It looks like Montoya made one heck of a nice claim back in October, when he snagged this son of Super Saver for 30k after a second-place finish going two turns over this very oval. What any of those last two mean today in a GI against some Derby aspirants is anyone’s guess, but a good race over the track can go a long way, not to mention that he’s got the running style to pass a few in the lane, so if they completely ignore him, he’d be worth a look underneath; exotics appeal. #5 Carpe Diem (Even): Deserving heavy favorite simply lays over this field on class for Pletcher and sure looked like a legitimate Derby horse in his comeback, when he won the GII Tampa Bay Derby by five in a common gallop. And sure, he beat absolutely nothing that day, but let’s be honest folks, this isn’t your dad’s Blue Grass and this field isn’t a whole lot tougher than what he just faced. Son of Giant’s Causeway is versatile enough to be placed anywhere, but in a race with absolutely no speed, it wouldn’t be surprising to see JV to put the best horse on the engine and let the rest worry about it. Those who saw his 6 1/4-length romp in October’s GI Breeders’ Futurity here know he sure likes this place, which only adds another club to his loaded bag and means the rest are in for a long, long day at the office; way too tough for a group like this. #6 Frammento (8-1): After a few rough years, it’s nice to see Zito back in the Derby hunt with this long-striding son of Midshipman who closed from way back to be third in the Fountain of Youth. And yes, someone had to be third that day, but it was no doubt an improved run with blinkers added, so you’re allowed to think that he can move forward again today. It’s also nice to see Stevens fly halfway across the country to ride him, though without a lot of speed, he’ll be at the mercy of the pace, which looks very, very slow, which means he’s going to be left with a lot to do off the far turn behind a horse who will be every bit of 3-5; mixed signals. #7 Classy Class (6-1): The most accomplished of the potential usurpers has been third in both starts this year, Aqueduct’s GIII Withers in February and GIII Gotham in March, and is the only one who has shown an affinity to run on the front end, so there’s a chance that he goes on a send mission and tries to clear. With Frosted at Aqueduct for the Wood, it’s no surprise that McLaughlin ships this son of Discreetly Mine here to try and get some Derby points and GI black type, and it’s a smart move, too, because it’s not like he needs to run all that faster to contend. But it’s also worth noting that while there’s been a lot of hype in this corner, at the end of the day, he’s nothing more than 1-for-4 with only a 6 1/2-furlong MSW to his credit, which means trying to complete an $8 exacta behind the chalk won’t be as easy as you think; trying to beat for second. #8 Danzig Moon (8-1): Speaking of hype, this Malibu Moon colt got a lot of it after a rousing MSW win in his 3-year-old debut at GP in February but couldn’t bridge the gap when he was fourth to Carpe Diem in the TB Derby. 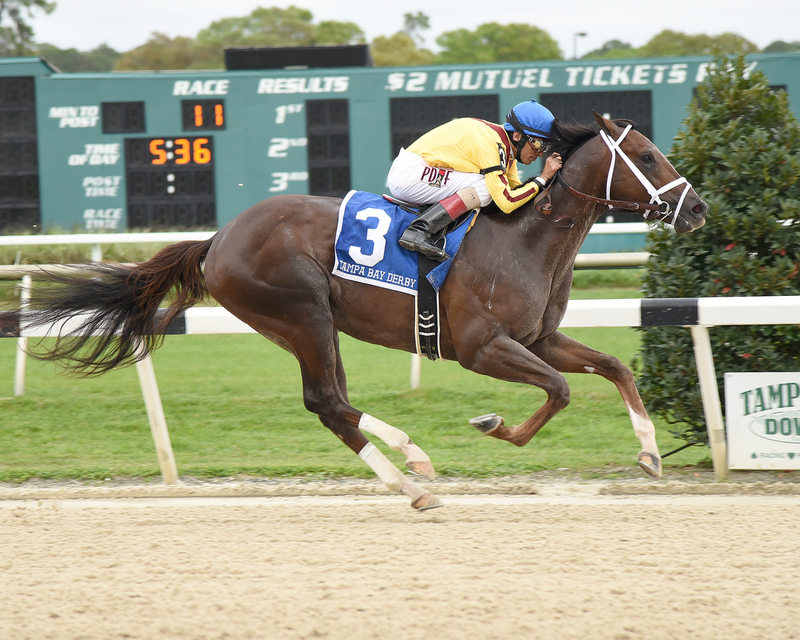 Taking on winners for the first time is never easy, though, and he was wide for much of the running, so it’s far too early to give up on this Casse colt, who clearly has talent and got a spin over the track when fourth in here in his debut. This post is no bargain once again, but he’s tactical enough to be close early and has plenty of upside, and there’s no reason to think that he can’t improve off that initial stakes try last time, so while he’s likely no threat to the big horse, he might be able to spice up the exotics underneath; the best of the rest.